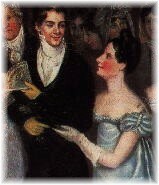 "A finished coquette at a ball asked a gentleman near her while she adjusted her tucker, whether he could flirt a fan which she held in her hand. 'No, Madame,' answered he, proceeding to use it, 'but I can fan a flirt.'" A lady would no sooner leave the house without her hat or gloves as without her fan. In the years before central air conditioning, it was an essential tool, not only for comfort but also communication. Made of wood or ivory and embellished with anything from small mirrors and jewels to portraits and feathers*, fans were certainly a versatile accessory. Fans, plain or fancy, with paint or lace trim, in any size or shape were certainly a necessity. In their book, Accessories of Dress, Katherine Lester and Bess Oerke state that, "The great triumph of the fan in the 18th cy led to the establishment of certain conventions and gestures in handling the fan which were considered of first importance. In gesture, in repose, the lady was invariably revealed by the way whe managed her fan! Though she possessed all the charms of beauty and distinction and failed in this, she passed quietly into social oblivion." With the fading of elaborate "Court Manners" during the Regency, the manipulation of the fan became of less importance, though it retained it's place "as a natural extension of feminine body language, slightly refined and channeled by precepts of etiquette." The art of "fluttering", (fanning one's self in a graceful, and at times, meaningful way) was said to take three months to master, and many girls doubtlessly spent hours practicing. It is obviously not a private conversation if everyone knows what you are talking about...I wonder how much gossip was started by someone's unintentional signing? How many relationships were nipped in the bud because it was hot and the young lady was simply trying to stay cool? *Special Note: If using a Maribou fan, stick to white feathers. Colors tend to look tacky with Regency wear. Want more information on the Language of Fans? Look Here! For another list of gestures and meanings, look here.